Neither mode on a DS-2 sounds or behaves anything a DS-1 to me. I’ve heard a lot of people say it over the years but I’m not convinced they even aimed it that way unless the Japanese DS-1 was actually THAT much different than the current one. My DS-1 has the Jizzer Mod so can't really compare it to my DS-2. I seem to remember them being similar but that was a long time ago. The circuits are totally different. Distortion and Tone controls/networks look really different. And apart from the long-tailed pair, all the FETs are used as switches. Three pairs of clipping diodes, and the remote Turbo input. Seems a little over-egged to me, but I've got cloth ears. Any idea on the DF-2 circuit, minus the feedback of course. All three sounded similar to me. About the most informative thread we've had on here in ages. Mike's spot on about the distortion path for the DF-2. The "feedbacker" bit is interesting, I'll have to find a YouTube video to hear how it works. It works like the EHX Freeze. A bit like tinnitus in a pedal. I've only ever seen one two bands exploit that pedal well and that was Swervedriver and the Kitchens of Distinction. 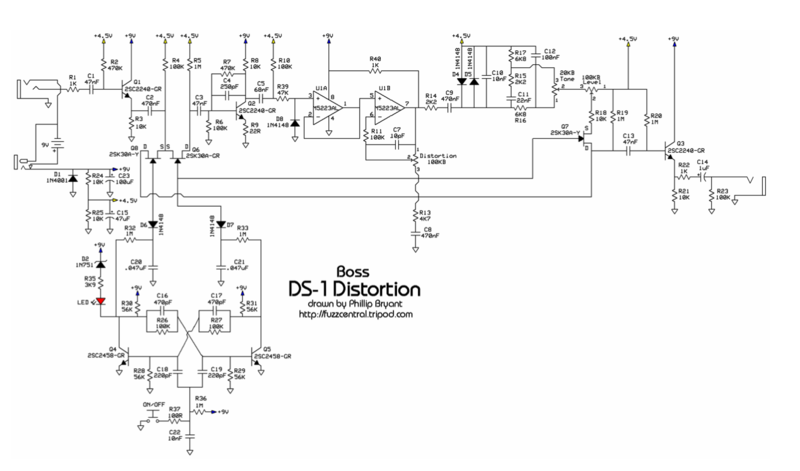 It's interesting to see the DS-2 is discrete components rather than op-amps...I normally expect newer versions of a circuit to go more towards the op-amp route because I assumed it would be cheaper. One of these days I'm going to buy that book that Boss published where they interview the techs/designers...I doubt it has circuit diagrams or schematics and the listing is probably out of date by now, but there's probably some interesting info on the design process for the old classics. I wonder what the guts of an OS-2 look like - it would be interesting to see how two separate circuits are squeezed onto one board. The OS-2 is really cool! So it really is what you would hope it is, two separate circuits you can blend before tone and output level are set.